The Samsung Galaxy Note 4 S-View Flip Cover was developed with your busy lifestyle in mind. This smart case, designed to protect and enhance the Samsung Galaxy Note 4, is the perfect combination of style and functionality. 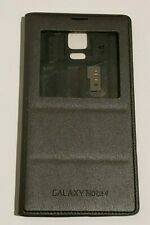 Model No: Samsung GS4 S View Flip Cover Black. User Review Missed event notifications.